Welcome to Shiv Swami's Bikanerminiaturearts.com . India has been a home and treasuregrove for art and mystic lovers. From the ancient times, the various civilizations cultivated various forms of arts and these kept transferring from generations to generations. This eastern world has seen many a art forms developing from cave paintings to miniature artistic prints. The flexibility of Indian culture and art gave shelter even to foreign invadors from the middle east, and merged itself with art forms brought by them. This website contains a selection of classical miniature paintings done by the artist, Shiv Swami. Miniatures are intricate, colorful illuminations or paintings, small in size, executed meticulously with delicate brushwork. Inspired by the beautiful flora and fauna of India as well as the deep-rooted traditions of elegance and style, these paintings cover a wide variety of subjects. 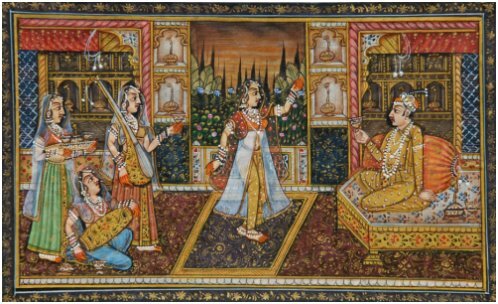 From flowers, embracing lovers to Mughal rulers, these paintings show the complexity of Indian tradition and culture. These masterpieces of yore have a universal appeal which still touch the right chord of the audience.